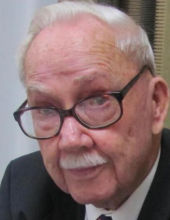 Celebrating the life of Walter Harshbarger, Jr.
Obituary for Walter Harshbarger, Jr.
Walter “Bill” Harshbarger, Jr. 98, of Milton, WV passed away on Saturday, April 6, 2019 at Emogene Dolin Jones Hospice House. He was born February 10, 1921 in Russell, KY; a son of Walter Harshbarger, Sr., and Maudie Baylous Harshbarger. He was a devoted husband of Imogene Hughes Harshbarger for nearly 60 years. He and Imogene were blessed with three daughters, Ann Marie Ostrander (Jeff), Amy Jarvis (Chris) and Susan Ramin (Leo); from these blessings they were given three beautiful granddaughters, Rachel Kay (Evan), Lindsey Ramin, Lauren Ramin and one well loved grandson, Walter Evan Jarvis. Walter was a WWII Veteran of the U.S. Army having served in the South Pacific. He retired from CSX as a locomotive engineer. Walter was a very civic minded man. He volunteered his time over the years with Milton Lions Club, Milton City Council, he started the Milton Neighborhood Watch, He cleaned Route 60 with the Adopt-A-Highway. He played the washtub bass with the Milton Senior Citizens Fun Band and worked the marching band concession stand at home games when his girls were in the band. He will be greatly missed by his family. Walter was preceded in death by his parents; his three siblings, Raymond Jack Harshbarger, Mary Leadmon and Dorla Erianne. His family would like to thank Home Base Primary Care of Hershel “Woody” Williams VA Medical Center, his two caregivers of Village Care Giving and all of the nurses and staff at the Hospice House for their kindness during this difficult time of grief. In lieu of flowers, donations may be made in his name to the Emogene Dolin Jones Hospice House, 3100 Staunton Road, Huntington, WV 25702. A private memorial Celebration of Life will be held at a later date. Condolences may be expressed to the family at www.tri-statecremationsociety.com. To plant a tree in memory of Walter Harshbarger, Jr., please visit our Tribute Store. "Email Address" would like to share the life celebration of Walter Harshbarger, Jr.. Click on the "link" to go to share a favorite memory or leave a condolence message for the family.